After another tough BodyPump session this morning (8.15am Saturday class, what the hell is wrong with me) I got to thinking about what makes it in to my gym bag each week. Unfortunately for me this morning I didn’t have any luck finding some pancakes, scrambled eggs or even a bloody coffee! 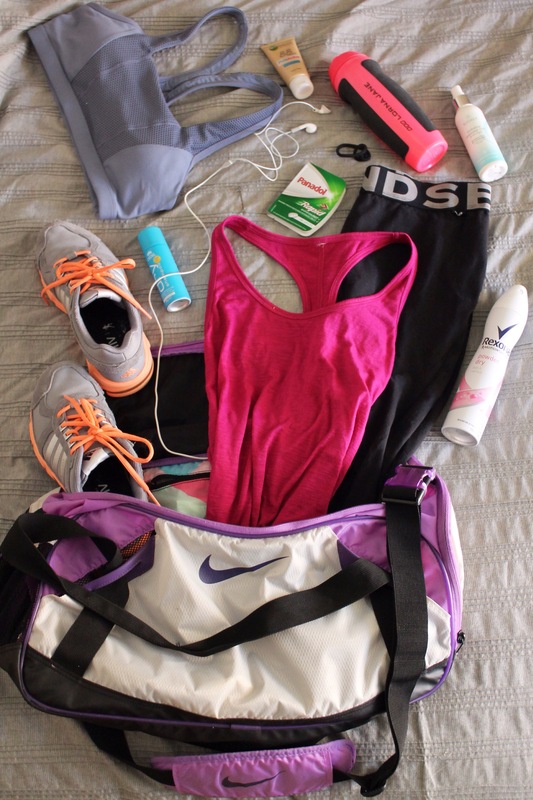 Maybe I’ve been packing my bag all wrong? Breakfast obsession aside, I have put some thought into what makes it into my bag because more often than not I end up carting it around with me all day. I knew I needed some supplies to freshen up after a big workout in the mornings before work and some items to help improve my workout, but I also wanted to keep my kit to a minimum. Bonds Active tights: These tights are so comfortable and make all those squats a little easier to suffer through. As the weather improves though I will have to look at switching to a 3/4 style. Lorna Jane Sports Bra: One of the first things I realised during a particularity vigorous Zumba session was that I needed a super supportive sports bra. The Electra Sports Bra is ridiculously good and makes the ladies look amazing! It makes such a difference to be able to work out with out worrying about any discomfort. Adidas runners: I picked up this bright pair of Adidas trainers on holiday in Hawaii and still adore them. They are light but steady and add a pop of colour to my gym clothes. Water: This is such an essential thing to have on hand at the gym and on the one day I forgot to bring my water bottle I ended up running back and forth to the tap during my workout which is just ridiculous/exhausting. Painkillers: I have these in my gym bag in case of a cracking headache or period pain that might stop me working out. Towel: A rather essential item if you plan on showering. Dry shampoo: For the days when you don’t want to or you don’t have time to wash your hair dry shampoo is your saviour! A few quick sprays on my hair line and then a quick brush through and my hair looks a million times better. Garnier BB cream: Instead of a foundation I usually just put on some BB cream after a class for a little coverage and colour, while keeping my look natural. The added sunscreen is an added bonus! Hydrating Rosewater Mist: This face mist from Kosmea works wonders on my flushed red face after a workout. It is great for cooling down your skin, adding some moisture and also for setting makeup. Hair ties: Now my hair is getting a bit longer I have to have it tied back and up while at the gym. The problem is I can never seem to find hair ties or bobby pins when I need them? Where do they all disappear too? Headphones: For longer walks and runs on the treadmill I find music is absolutely important for keeping me motivated. Specially thanks go out to Tay Tay and Beyoncé for some super bouncy tunes. What makes the cut when you go to the gym or workout? What songs motivate you?